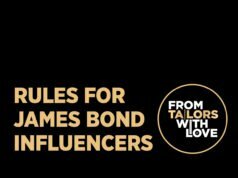 This week Peter Brooker and I focus on James Bond’s winter wardrobe. Considering the weather in much of the northern hemisphere this time of year, it’s difficult to focus on anything else clothing-related. We each picked three of our favourite Bond winter wardrobe items to discuss. 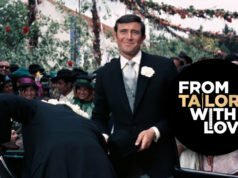 I talk about Roger Moore’s navy chesterfield in Live and Let Die, Sean Connery’s grey flannel three-piece suit in Thunderball and Pierce Brosnan’s double-breasted cashmere coat in Tomorrow Never Dies. Pete chose sportier items: Daniel Craig’s Barbour jacket in Skyfall, Roger Moore’s yellow ski suit in The Spy Who Loved Me and Daniel Craig’s nylon-front blouson in Spectre. Before we get to the winter wardrobe items, I talk about my visit to the Metropolitan Opera where I saw Adriana Lecouvreur by Francesco Cilea. I noticed that composer John Barry—who arranged the original recording of the “James Bond Theme” and went on to score eleven Bond films—must have been a fan of this opera because he quoted the Act IV “Prelude” in the score to Moonraker (a personal favourite of mine). You can hear the comparison in the podcast. Pete shares his visit with Spencer Hart founder Nick Hart, who talks about outfitting Pierce Brosnan and more. 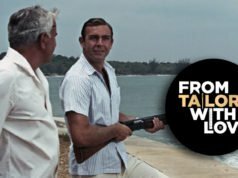 Pete and I talk about Roger Moore’s white, blue and red windowpane dressing gown from Live and Let Die that was recently sold at Aston’s Auctioneers & Valuers on for £3,600. The auction reveals that this dressing gown was made by Sulka, who Roger Moore mentioned a decade earlier in an episode of The Saint, and who made Pierce Brosnan’s shirts for GoldenEye. You can download the podcast from iTunes or Stitcher, or you can listen at the top of the page. You can find more notes on the podcast at Human Research. You can also follow the From Tailors with Love Twitter feed, run by Pete. If you have a question you’d like answered on the podcast, send us your questions through our listener mail form.